Fudge and peanut butter are two of life's best indulgences, so why not combine them? 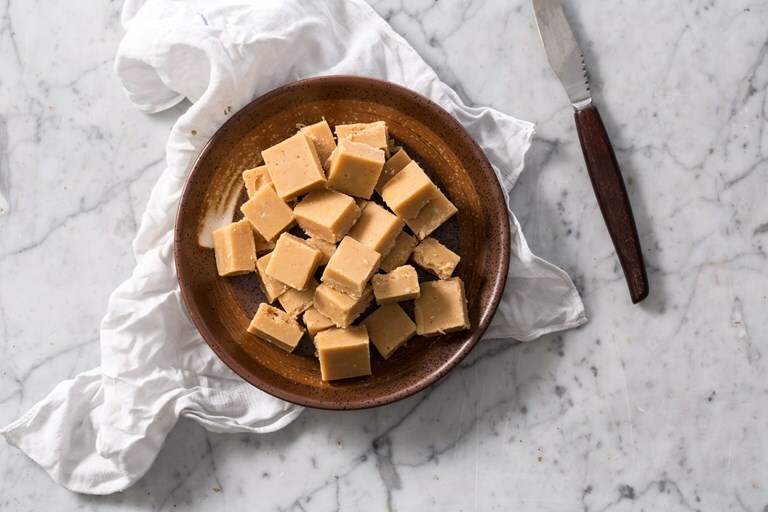 Sally’s delicious peanut butter fudge is wonderfully creamy and make a perfect petit four. Make them for your next dinner party and watch them fly off the plate. If there is one way to improve fudge in my opinion, it has to be by adding peanut butter. The creaminess, nuttiness and the slight saltiness of this sweet treat make it mouth-wateringly irresistible, so fortunately this recipe makes a good amount. It should keep for about a week, or even longer if stored in the fridge. The other great thing about this recipe is the sheer simplicity of it: no fussy boiling and testing of raging hot sugar and the resultant shouting and swearing when it doesn't set. Just mix it all together and you're done, easy. If peanuts aren't your thing you could try this with almond, cashew or macadamia nut butter, and fold through some chopped nut pieces if you want some texture – I prefer a silky smooth melt-in-the-mouth feel personally.